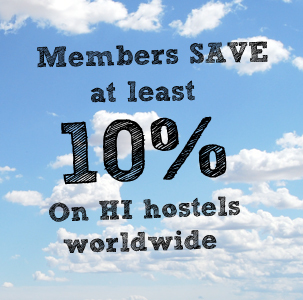 Being aware of our ecological impact when travelling has never been more important, and with HI Hostels, you can be environmentally-conscious and budget-conscious – without sacrificing quality. All of our 4,000+ youth hostels must adhere to the Hostelling International (IYHF) Sustainability Charter, which sets out criteria for conservation of resources, waste disposal & recycling, care for nature and environmental education. At the same time, all HI Hostels must also uphold our internationally-agreed Assured Standards, which guarantee levels of comfort, cleanliness and security wherever you stay. 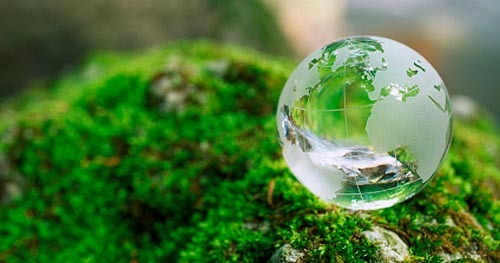 Some of our hostels have gone the extra mile, and have fully embraced the ethos of environmentally-friendly travel. Many of these eco hostels have been built using sustainable materials, and others look after the environment through green practices such as composting, water conservation, installing energy-saving devices or serving organic produce in their meals. Some of our green hostels have even achieved internationally-recognised awards for their care for the environment, such as the Green Key, Swan Ecolabel or Green Stars. Others are located in popular ecotourism locations and focus on sustainability by sourcing locally, providing low carbon-footprint activities such as horseriding, or offering access to nature reserves and contributing positively to the local community. Here is our pick of the best eco hostels & green hostels around the world. Voted as one of our top centres for social volunteering, our hostel in El Villar, Bolivia presents a whole range of different community engagement projects, and clustered on a rugged mountain ridge soaring 3000 metres into the Andes, there are few better ways to see one of South America’s most intriguing, naturally beautiful and diverse countries whilst giving something back to the community. El Villar hostel allows you to explore Bolivian roots through local intercultural exchanges, whilst offering work experience in education, health care and conservation. They can even provide Spanish courses to help you brush up on one of the world’s most widely spoken languages. Tide pools, redwoods, elephant seals, grey whales, hiking, biking, and the famous cliff-side hot tub await you at HI Pigeon Point Lighthouse Hostel! Perched atop a cliff on the site of a 115-foot-tall, working lighthouse, HI Pigeon Point Lighthouse is one of the top-customer-rated HI hostels in the world. The hostel is a Certified Bay Area Green Business. Their green practices include composting; recycling; reducing water and energy usage through efficient appliances, lighting, and faucets; and using environmentally friendly cleaning products. HI-Point Reyes is two miles from the ocean in a secluded valley on Point Reyes National Seashore, known for its abundant flora and fauna, including bobcats, fox, deer and elk, harbour seals, and sea lions. Last February, HI Point Reyes opened its first ‘green building’ and received an official LEED rating, which is based on the following categories: Sustainable Sites, for encouraging strategies that minimize the impact on ecosystems and water resources; Water Efficiency, for promoting smarter use of water, inside and out, to reduce potable water consumption; Energy and Atmosphere, for promoting better energy performance through innovative strategies; Materials and Resources, for using sustainable building materials and reducing waste; and Indoor Environmental Quality, for promoting better indoor air quality and access to daylight and views. This mountain hostel has unbeatable natural energy, with all the amenities, warmth and friendliness you need, 10 minutes from the centre, nestled in 2 hectares of native forest grounds, with a stream and panoramic views of the Andes Mountain Range and El Bolson Valley. Altos del Sur hostel serves a breakfast of homemade forest fruit cakes, growing their own groceries, cooking homemade, vegetarian meals and typical products from the region. The Solscape Eco Retreat offers a range of sustainable accommodation options. There are self-contained cottages built from untreated, recycled native timbers and earth bricks, “off grid” tipis for up to 4 people, and recycled railway carriages for individual backpackers, families or groups. Other ecological features include solar LED lighting, solar-heated showers, composting toilets and non-toxic building materials. The hostel is located a stone’s throw from the world-famous Manu Bay and Ocean beach, ideal for surfing or sunbathing – and the hostel also offers on-site massage therapy. This hostel uses solar panels to capture the Australian sunshine and convert it into energy. Offering additional eco-friendly features such as wood-burning stoves and organically grown herbs available from the garden, this green hostel is also perfectly placed for visits to the nearby Otway Rainforest and local waterfalls. Located in the middle of the Great Ocean Road and right on the beach, Eco Beach YHA has a rooftop deck for relaxing after seaside activities such as surfing, windsurfing, snorkelling or paragliding. This green hostel prides itself on its ecological credentials, and aims to contribute to a more culturally and environmentally aware travel industry. The hostel has been awarded the Swan Eco-label in recognition of its efforts in this area. Located next door to the largest geothermal swimming pool in Reykjavík and within easy access to the Icelandic glaciers and geysers, this HI Hostel is the perfect base for learning about and experiencing the awesome power of nature so evident in Iceland. Danhostel Ribe acheived the prestigious Green Key award for its environmentally-conscious practices. The hostel is located in the heart of Ribe, the oldest town in Denmark. History-lovers can explore the town’s rich 1300-year history, including the medieval town or Viking museum, and eco-travellers can visit the nearby Wadden Sea National Park, one of the world’s 10 most important wetlands. Danhostel Kalundborg was the very first hostel to achieve the Green Key award, and it maintains its environmental status to this day. The HI Hostel is located near the pristine Blue Flag beach at Kalundborg, situated in the green western area of Denmark called Zealand. You can swim or sunbathe on the beach, go for woodland walks or visit the medieval old town for a dose of history. Located in the high atop Rannoch Moor, this eco hostel has incorporated many environmentally-friendly features as part of its recent refurbishment, including wind and solar energy, recycling of grey water, dry toilet systems and ecological paint. With stunning views of the lake and a location far from the chaos of modern life, this small, cosy HI Hostel is the perfect escape for walkers and hikers. Located on the outskirts of Vienna with stunning views of the city, this HI Hostel is set amongst meadows, forest and vineyards. The hostel has been awarded the Austrian Ecolabel, and serves fairtrade and organic products in the included breakfast. 25 minutes away from the bustling city centre, the hostel location combines the convenience of being near the city with the relaxing atmosphere of the countryside. This hostel is adjacent to the LOFT modern art centre, set amongst a lush green environment of plants and trees within the neighbourhood of Hua Qiao Cheng. This area of ShenZhen has been recently regenerated, and many old buildings have been repurposed and given new life by introducing modern design while respecting their history and community value. Many art galleries, studios, coffee bars and restaurants are now home to the area. The hostel’s mission is to “promote cross-cultural exchange, environmental awareness and social responsibility” and its location is perfect for visits to the nearby nature reserve for bird-watching, or the botanical gardens.